What can you expect at the San Francisco Aquarium? It’s one thing for an aquarium to show off an interesting and diverse range of marine life, it’s quite another to do that with a focus on conservation as well. The San Francisco Aquarium of the bay does just that, with a huge range of marine life that doubles as an educational facility. It’s one of the best aquariums in the U.S., here are just a few reasons why. The Aquarium of the bay is much more than just a place to take the family for a fun day at the aquarium (although it does this extremely well). This 50,000 square foot building partners with The Bay Institute to “protect, restore, and inspire the conversation of San Francisco Bay and its watershed.” This means that its reach extends much further than entertainment. It provides research on local shark populations, assists chefs and restaurants in selecting sustainable seafood, supports endangered species, and combats climate-induced sea level rise. This is just a few of the many ways it gives back, and why it’s so much more than an aquarium. Even without the conservation aspect, the Aquarium of the Bay is world class. You’ve got daily events like “8 Arms, 9 Brains,” where the aquariums line of octopuses are shown off. A naturalist from the aquarium goes through activities designed for these invertebrate, showing how they use their alien-like senses to solve complex problems. Or visitors can learn about sharks with “Shark Talk,” where naturalists present a wide range of sharks that inhabit the San Francisco Bay, explaining how sharks have adapted to become a diverse but misunderstood predator. Those shows, coupled with other daily events such as a Tidepool feeding, jellyfish show, and a kelp forest ecosystem presentation are part of the activities that are available at the aquarium. With so much to do and see, the Aquarium of the Bay is surprisingly affordable. Adult tickets are $19.95, children (ages 4-14) are $11.95, and seniors (65 +) are $11.95 as well. There also a family rate (2 adults, 2 kids) of $64. Plus, when you book online, you save a dollar or two on each ticket. 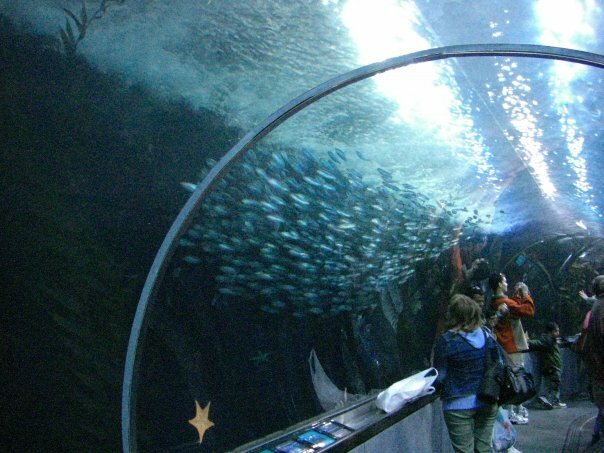 Groups of six can receive a massive discount at San Francisco Aquarium of the Bay with Smart Save. The aquarium is open from 10.00 am to 6.00 pm most days of the week, and except for Christmas day, it’s open year round. One of the best things about the Aquarium of the bay is its location, it’s right on Pier 39, a 45-acre waterfront complex that’s home to more than 14 restaurants, 90 shops, and even a water park. It’s only two blocks east of the Fisherman’s Wharf, and you can see the Golden Gate Bridge and Alcatraz from there. Suffice to say, you’ll have a full day exploring.